Of the 4500 or so airports in the United States, the major airlines only service about 10% of them. Security concerns have also made passenger airplane travel a time-consuming endeavor. As such, for some companies it's quite likely that a business case can be made for the purchase of a corporate jet (though not always). 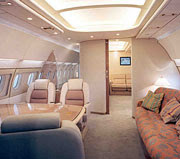 But increasingly, executives have begun to make personal use of the corporate jet, for which no business case can be made. This is a veiled attempt at increasing compensation, without the appearance of doing so. In some cases, an executive's personal (i.e. non-business related activities) use of the company jet costs the company more than his entire salary! In most of these cases, the company will also issue a bonus to the executive to cover his related tax bill! A strong corporate governance process is of vital importance to shareholders looking to maximize their returns. Shareholders can get clues as to the quality of a company's corporate governance by examining the company's behaviour when it comes to items like corporate jets. For example, consider Abercrombie and Fitch, a company we discussed last year as one that re-affirmed its strategy, only to seemingly change it a few weeks later. The company and its CEO recently entered an agreement whereby the CEO was limited to keeping his personal use of the company jet to $200,000 per year. This still seems fairly generous, as $200K for vacation travel in a year does seem rather excessive, but at least it's capped at something, right? Unfortunately, in return for signing this agreement, the CEO was provided $4 million in cash! This makes you wonder...how much personal use of the jet was he getting before this agreement? A significant amount, if this payment for the $200K cap is any indication. His base salary is just $1.5 million, meaning his use of the corporate jet was a significant perk! Managers will always try to glean what they can from the company kitty. It's human nature, and so they can hardly be blamed in the aggregate. But as a result, the importance of a governance structure that protects shareholders is instrumental, so that the managers are working for, rather than against, the shareholders. Frivolous use of company property should be a clear sign to shareholders that all isn't right with a company's governance structure, and so they may wish to avoid such companies. Disclosure: Author has no corporate jet, and reserves the right to change his mind should his company acquire one.